I don’t function out of obligation. I mean I used to. I used to feel as if I had to do something or go somewhere just because of who the person was. If my “boss” was having a shindig, then I felt obligated to attend. When my grandmother purchased my first car (and I had to make car payments to her), I in turn felt required to do pretty much whatever she said. But I turned a new page around 2011. Around 93% of my life is spent doing what I desire. Period. If I’m at your soiree, then please believe I want to be there. I don’ feel obligated to show because you’re my cousin or co-worker; I’m there because I want to be and have made myself available in that way. Making this decision has created a sense of liberation, not only on my part, but also on others’ as well. I don’t expect for people to do things for me just because of who they perceive me to be. I don’t need to prove myself to anyone. Around mid-2015, I posted something like this to FB: I’m no longer proving I’m a good friend, family member, or co-worker. I meant that with my whole heart. Perhaps this can be part two of the obligation section. For a long time, I wanted people to know they could count on me. There’s nothing wrong with that, except I’d begun doing things that were not aligned with my character. Consequently, I didn’t say no to a lot. For example, my then best friend used to visit the States every other year. Because I wanted her to know I was her friend, I agreed for her to stay with my family and me for 2-4 weeks at a time. Through this process, I discovered that three days is really my maximum for visitation. Therefore, 14-28 days was overload to my soul. But I agreed because of some unwritten social contract: this is what best friends do. The proving myself days are over, both professionally and personally. You’re either cool with me and how I engage, or you’re not. I recognize patterns and then step out of them. I’ve become reflective as a way to take ownership for who I am and the choices I make. 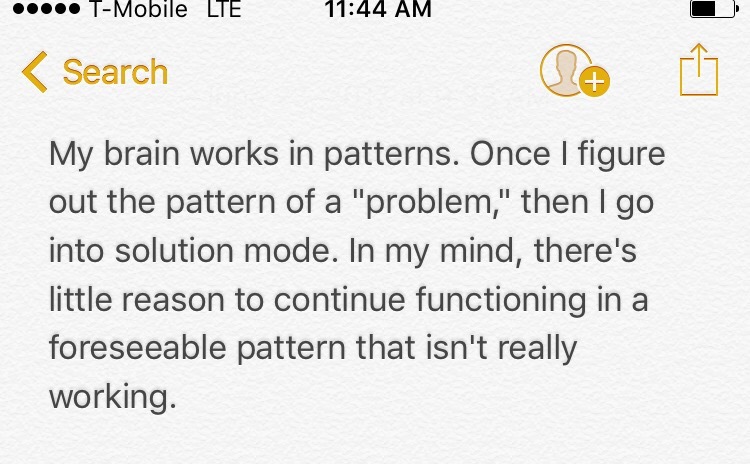 Because of this, I’ve gotten adept at discovering my own patterns of behavior, looking for root causes, and then choosing different paths. For example, I recently realized that finding a job I like is challenging. There’s always something I absolutely hate. Consequently, I’ve had to think deeply about why that is because quitting and getting jobs every 2-3 years is exhausting. I’ll likely follow this up with a longer post, but my point is, enough is enough of this cycle. I have to figure out what’s going on inside so I can step out of this behavior pattern. Are there ways that you think or act differently than what society tells you to do? Do either of these resonate? Let me know what you’re thinking. I think so too! I’d rather you show up because you like me and my company, not because you think you owe me because I attended your baby shower, or something like that. What helped me understand I could also do this with family is when I realized many of them don’t show up for me simply because we’re related. They are quite honest in telling me, “No…won’t be able to do that” lol I suppose they liberated me as well. I understand about the 2 dinners. My Christmases up north used to be like that! A lot of this resonated with me. At times I find myself worrying and trying to be what others want me to be. Then I think about I don’t want to look back on life and realize I lived my life mostly how others wanted it to be. I can definitely agree with this post. I’ve always been the type to mind my business, so when I hear of other people’s social issues, I can’t always relate. Also, I can’t stay somewhere and do things that don’t make me happy, which is why I don’t keep jobs for very long, either. I’ve surprised myself with one of my current jobs because I’ll hit the two-year mark there next month. I really don’t know if I’ll make it to three, but we’ll see! As always, your posts are very thought-provoking. Thanks LeTara! WooHoo about your two years…and I mean that sincerely. My youngest daughter asked, “Mommy, have you ever been somewhere longer than five years?? ?” The answer…no. lol AND Yes ma’am to minding one’s own business. Sheesh! As always, your words are food for thought and inspiration. I have read it many times and I appreciate your very clever way of (re)ordering things. Or I should say, slices of living. My first is I do my best for who I am and not for others’ perception of who they want me to be. I function out of mutual help, not of obligation. Of course, there are cases (business) when I have to offer more, but I do this because I want to, not because I feel obliged. And two years ago, on my birthday, I decided to quit apologizing for who I am. I think personal freedom has many things to do with this. This has been a long journey for me, too, as I grew up self-conscious and suffused in my not being-like-the-others and not fitting in. About patterns, yes, we all live by them and make decisions according to them. As in your case, it was very hard for me to find a job I liked, so I created a job for me. Which is never easy, on the way through difficulties I realized I must reorder things and redo patterns. I do not give in to things I hate, and I always prolong doing what I like. Like writing. Personal freedom is at the root of all things for me. I just cannot possibly live for someone else (through obligation or any other reason), so I understand what you’re saying here. I’m finding that creatives seem to have this common job challenge and creating one’s own money-making situation seems to be the path to take. Thanks so much for commenting Iulia. Kathy – I am totally loving this post! I love your 3 ways of functioning outside of society’s prescriptions; number two (about not needing to prove oneself to others) is a current work-in-progress for me. Ever since I was young I knew that I wanted to shape my own life, and that has made for a creative, sometimes exhilarating, and often bumpy road. I’m not sorry, but I have fallen into the trap of making unconventional choices while hoping to achieve conventional rewards! Great food-for-thought, here – I think I’m going to do some journaling about it. Thank you Leslie! And so, a light bulb just went off for me when you said, “I have fallen into the trap of making unconventional choices while hoping to achieve conventional rewards.” That’s my challenge, I think, especially when it comes to choosing jobs. I’ll have to think some more about this part too. Yes to your comment about #2. It’s challenging because we (people) are really good at trying to guilt someone into doing what we want them to do and attaching that to love, like, proof of care, etc. I’m so over it though. I have found as I age I just don’t care about obligations and ‘shoulds’ anymore. And proving your worth to people seems a waste of time! They either get you or they don’t, really. I have discovered that I am very driven by fairness and that’s where I focus rather than what I should be doing (like towing the line). Reena, you’re absolutely right about all of it. It’s like something just eeked out of me when I turned 40. So inexplicable! I especially had the not proving my worth to people part reiterated over and over. You’re right. It’s a HUGE waste of time. Here’s one for you. Does this ever happen to you? Have you ever thought if having a “Boundary” (only at your house) of: “No cell phones in my house. Leave it out in your car. If you”re coming over to visit and talk, cool! Let’s do that. Or, fo you feel that’s going to far? Why? I’m mulling that one over, still undecided. I guess that’s the thing with boundaries. I understand that they’re for the individual person to make, and I suppose if you don’t want to follow the boundary, then you don’t have to be around the person. But as for myself, if you told me that I have to leave my phone in the car to visit you, then I’d probably never visit. Can’t say if it’s too far or not, but in that case, like all other boundaries, I would have a decision to make. I don’t see anything wrong with that at all! You’re asking to connect to another person without distraction, how can that be wrong😀 I think this is one of those situations where your delivery in asking is going to determine how others respond . Reena, you might be right about delivery, but quite honestly, I’m not sure how someone could ask nicely for me to leave my phone in the car to visit. In the car might be too much but turning it down so you aren’t checking it constantly seems appropriate. There we go! This is why I looove WordPress bloggers. I believe we really do have conversations and try to understand and create rationale solutions. Charlene, I laughed through this entire response lol I understand completely, especially about the Secret Santa. Do you know one year I participated and went all out for my person and the person who had me gave me a pre-packaged mug set? I know I should let this go lol, but I was just too through when I opened it. I’ve always been a rebel. When I was living at home, I would always was forced to do things I just did not want to do out of some misplaced obligation. My mom was always running to do certain things because “she had to.” She was big in following societal norms. I remember when I got first got my own place, I put all my socks in the bottom drawer of my dresser. For years my mom always said they had to go in the top drawer. Why? Now, as an adult, I don’t do things out of obligation or even expectation. I do them because I want to. And only because I want to. People don’t like it or maybe they just don’t understand it, but hey, it’s not my job to explain it to them. Always love reading your post! I meant to respond to this yesterday. You must be my long lost younger sister 😉 I’d always felt terribly confined as a youth. I would dream of the days when I could grow up and do things how I wanted to. And the things you’ve mentioned seem so silly for people to be so bothered by, you know? Like who cares where your socks are? Just make sure you put some on if it’s cold. So quick question…how does your personality impact how you raise your child? And thanks for the compliment! I appreciate it. It definitely impacts how I raise them! I don’t enforce arbitrary rules. I don’t care where they put their socks. I don’t even care if they match. Just put them on, black and pink whatever. I let them express themselves more. I don’t force them to eat foods they don’t like. I do insist they taste it but for example, my son HATES potatoes. So, I don’t make him eat them. It drives my mom mad actually lol. I meant to say that I increased my contribution to my Fidelity Savings Plan to 10%. The job will never get better and my arthritis and overall health problems are getting worse. Rather than complain it’s time to leave the abusive workplace. After 10 years at this abusive job my health has suffered greatly so I’m leaving in 2018. I’m putting in my paperwork by March for retirement. The only reason I stuck it out that long was the poor economy. Also it is extremely difficult to make a career change after 50. Of course being that I will only be 59 next I must get another job until I turn 62. I increased my contribution to my Fidelity Savings Plan to have that extra cushion. Good for you girl! I know that’s a challenge, especially given your age, but I know you know your peace of mind will be worth it. Yes! Maybe it is an age thing, but I’ve made the same realizations too. I also don’t ‘chase’ people anymore. I don’t use a scale, but if you want to be me in my life, have a relationship, I do expect a bit of interest in me/my life, and take the initiative to connect every once in a while. If I haven’t heard from someone in months, without knowing about the reason behind it, well…I stop making an effort to keep in touch. I used to think, I was being to harsh, but trying to be kind, doesn’t mean I am a fool. Good for you Patty! Yes, I don’t think it’s too much to ask that someone reciprocate in a relationship. I do the same as you when it comes to making a decision about forging ahead with the relationship. And there are no hard feelings about leaving on my part. Thank you Joan! I appreciate that compliment. 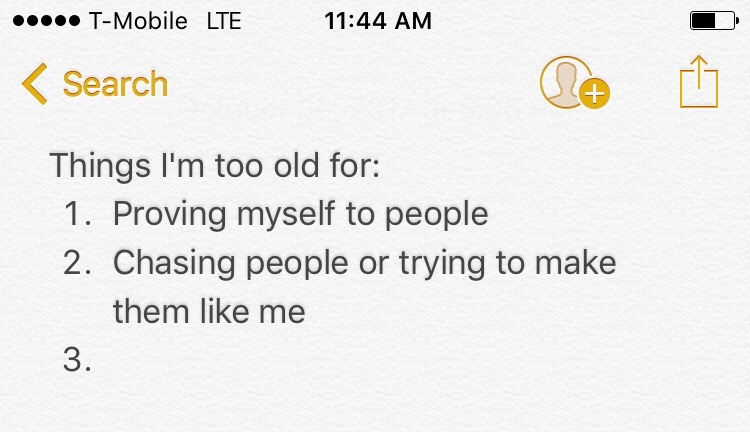 It took me decades too lol At some point I had to realize that I have to take responsibility for my own actions and not blame others. Yes, obligations are challenging, but after the first time, then people get the message. I just watched a video that also described how to do this without being an “a-hole,” which the speaker described as the number one challenge. No one wants to be seen as mean. According to her, if you let the person know within a fair time frame and are firm with your answer, then everything should go well. I have heard “But the nobody in the world thinks that way, you need to learn to be a bit smarter” …I am actually convinced of my ways 🙂 even if they don’t sometimes make sense. I will not live with any pretense or facade whatsoever. I do agree with all 3 ways you are different completely. Haha I’ve learned that people don’t take too well to those of us who are “convinced of our ways” lol I appreciate your way of living, most definitely. Haha so true 🙂 I appreciate your writings – so clear and truthful. All of your points resonate. Right on! The need to please is intolerable at this point in my life. I’m with you on one and two. It’s a new way of living for me as well, but I much prefer it to how I used to do things. You’re secure enough not to be too concerned about what others think of you. Me, I don’t have that level of self-confidence. But I wish I did! Awww thanks Neil! I suppose it is a type of self confidence…never thought of it that way. I love and appreciate your reflective lists. I love it. It takes growth to truly believe you’re enough just the way you are, and it’s terrific you expect others to respect your boundaries. Just last week, a good friend was desperate to get an apartment – she is going through a divorce and has bad credit for many unfortunate reasons (she was sick and lost her job – she almost died). Oh, it was so hard for me when she asked if I could co-sign on her apartment lease. I rarely say no and this was one of those things I thought hard about and decided to refuse. Fortunately, she was kind and apologetic about even asking me. She did find someone else to help her. In the past, I might have done it because that made me a “good friend.” But more and more, I see shades of gray because I’ve lent money to other friends and it actually tainted our friendship. Thank you for your thoughtful words and inspiration. I’m with you! I used to think that it took maturity to live the life you want to live: that you had to go through various stages and experiences before you could make a decision about what is right or not for yourself before moving forward. With observation and experience (ha ha), I now realise that it’s very much how you are made up. We as individuals are all very different. For example, the other day, I said to my daughter, someone has taken something I said the wrong way and I was beating myself up about how to react and not let the other person feel bad. My daughter’s advice was ‘just tell her she got it wrong!’ Plain and simple! It was then that I realised that we are all different, and that the solution for my daughter was just get on with it, don’t pretty it up. Whereas with me, I needed to consider how the other person would feel before I could tell her that, that wasn’t how I meant it – I needed her to feel good about getting it wrong. So to a large extent, my feelings took second place – it was all about the other person and not me. lol about your taking a bloody long time to get here…at least you’re here Marie 😉 I do agree that I also wished I had the courage to do this long ago because it does take a lot out of you and I think in some ways, you just end up hurting yourself. Also, agree about all of us coming here with specific personalities, but society, families, friends kinda slowly beat it out of us in order to conform to what they think is important. I have a habit of getting jobs that I move on from once I master the basic skills. I used to think I was a quitter, but now I know I need a challenge, and many new experiences. Regarding the rest of your post, I’m slighty embarrassed to be learning those skills at 58. I think it was Maya Angelou who said in an interview that she never does anything she doesn’t want to do. It took me a long time to figure out how that could be possible. I also finally figured out that having much more than the basics, materially-wise, isn’t important to me. Rather than money, I value alone time and peace of mind. I never had that growing up. I’m so glad I stumbled across you and your blog. I’ll have to find the video I just watched. It’s a TedTalk that explains how to say f*ck it…or something like that. So many things you said echoed for me, especially the part about learning to be true to yourself and saying no. My boss is an extrovert who likes everyone to be social and I don’t operate that way. I’ve respectfully explained this to her and it has helped but I would still prefer to work for myself someday. Being around a lot of people is not my comfort zone, especially the older I get, but I don’t have trust fund, haha. I’ve had a boss since I was 13, many times more than one. Have you done or read any codependent recovery work? That was the game changer for me. Our culture is set up to expect certain things; likes on posts, returning favors etc. which are very codependent. Real love doesn’t have to prove itself. I’m looking forward to your next post on this. Apologies E! This went to my spam folder. Omgosh! I just responded to someone that I think we (people) do a a great job of guilting people into thinking they have to do what we want in order to prove love, like, etc. Sheesh! Glad to know I’m not crazy about this though. I’ll have to Google “codependent recovery work” because it sounds very interesting. Empowering indeed. Annika, girl, you wouldn’t believe it if I told you, but this particular person would’ve NEVER understood if I said no lol It would’ve been the…end…of…the…world. Thanks for the job well-wishes. You know I’ll be writing about any developments/changes/shifts 😉 And thanks for the reminder. I’m thinking you’re right. Totally recognise some aspects of my life here. Although, it can still be challenging! Great post.